Game of Thrones is getting ready to make its return to TV and just recently HBO released a promo trailer that is something greater than a voice behind a black screen. The promo trailer is great and gives us some fantastic glimpses into the new season, which is guaranteed to be filled with more dragons (adult dragons! ), more drama (royal throwdowns! ), and more journeys (mystical adventures!). Honestly, I had trouble getting through the first season. I made it through, however, and was very glad I did — and after the second season I was completely hooked for good! While I’m not a diehard fan (haven’t read the books unfortunately) I am a faithful follower of the television series and can’t wait to see where the showrunners take these characters’ stories. The trailer premiered on February 22nd and I watched it while chomping on my nails. Fantasy adventures are nerve wracking, you know? 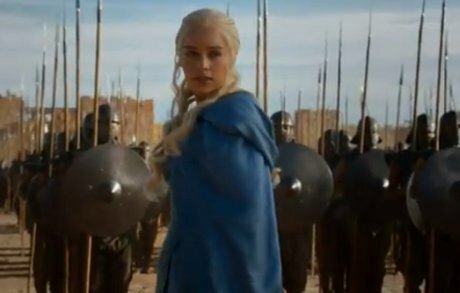 If you watch the video, presented below, you’ll see that Daenerys is depicted with an army ready to fight alongside her for her rights to the iron thrown. And she doesn’t just have an army by her side; she also has growing dragons at her call, and I wonder if the world is truly ready for the Mother of Dragons and the fire she’ll undoubtedly bring to the battlefields. Lil craphead King Joffrey continues to think he’s the baddest of all asses, and he says, “Everyone is mine to torment.” I hope this season he gets knocked down a few pegs and comes to know his place, which isn’t on the throne! His crazy mother is also there. Yeah, her crazy is always there lurking in the shadows, stirring drama. The visuals are great, which is usually true with HBO shows. Game of Thrones Season 3 premieres on March 31st, and we hope you’ll watch this epic fantasy series with us this season! If You Want More Hot Celeb Dirty Laundry News Then Please Like Us On Facebook and Follow Us On Twitter! “Game of Thrones” Season 3 Preview: Fantastic Featurette Gives a Behind-the-Scenes Glimpse!